Two goals apiece by Jimmy Muitt and Jimmy Wild and a first Rocks strike by Harvey Read put Bognor into the semi-finals of the Sussex Senior Cup with a 5-3 win over East Grinstead - but only after the visitors had fought back from two down and forced extra-time. Read and a Muitt penalty gave the Rocks an early lead but the Wasps made it 2-2 before the break. After a goalless second half, a Wild double and a super finish from Muitt left Bognor 5-2 up before the visitors scored the final goal. The Rocks join Haywards Heath in the semi-finals while two other last-eight ties have yet to be decided. The semis wll be played at Sussex FA HQ in Lancing around the end of February. The Rocks had a host of players still out injured – and on top of those were without keeper Dan Lincoln (work commitments), left-back Joe Tomlinson (not available from parent club Brighton) and centre-half Ed Sanders (cup-tied after playing three minutes as a sub for Whitehawk). 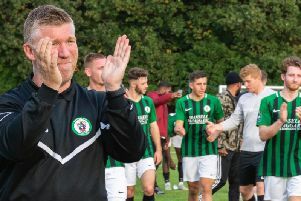 East Grinstead play a division below the Rocks in the Bostik League - they are 14th in the south-east division - and would have arrived at Nyewood Lane thinking they could have a chance of causing an upset against their under-strength hosts. Bognor had the ideal start when Read – the former Eastleigh centre-half signed last Friday and playing only his second game – bundled in a corner at the near post. They weren't too far off a 2-0 lead in six minutes when a Muitt corner flashed across the goal area. Soon it was two as Josh McCormick’s run into the box down the right was crudely halted and Muitt stepped up to slot away the spot kick. The Wasps took their time to get into the game but did gradually start to knock the ball around, though without carrying any early threat to the goal guarded by dual-registered Kieran Magee. Bognor wanted a third goal to all but settle the contest and Wild should have got it on 20 minutes when he ran half the length of the field on his own but shot too close to the keeper, who saved with his legs. Then skipper Harvey Whyte planted a header wide from six yards when it looked like he couldn't miss. Suddenly on 22 minutes East Grinstead pulled one back with a superb strike that arrowed into the top corner with Magee helpless. Wild was giving the Wasps defence a few difficult moments but was guilty of putting a header over the bar when another Muitt corner found him unmarked. East Grinstead were on level terms on 34 minutes when a shot was not dealt with by Magee and was converted from close in by Matt Day. Muitt's fierce shot wasn't held by EG keeper Brannon Daly but there was no-one there to put away the loose ball. The opening 10 minutes of the second half were something of a non-event, with neither side able to keep possession or carve out anything resembling a chance. East Grinstead made a change on 58 minutes, replacing Karn Miller-Neave with sub Callum Emptage. The Rocks followed with a change of their own and it was a debut for Chichester College academy utility man Roland Kardos, brought on for Charlie Osborne. McCormick was having a good game at right-back and he gave the home fans what, for the second half at least, was a rare bit of excitement when he got to the byline and sent a cross into the six-yard box but the keeper gathered. Bognor eventually started to dominate the play and Muitt carried their best hope of a breakthrough with a couple of lung-bursting runs down the right. One ended in a cross put right on Wild's head but his effort was horribly wide. Then Muitt went for goal himself and a low shot across Daly was deflected for a corner. The pressure was growing and a Wild cross came back off the angle of post and bar and almost fell to Muitt. Magee needed attention from the physio after an accidental kick in the face as he went down to gather a through-ball. Corey Heath came on ten minutes from time for another step on the road back to full fitness, replacing Scutt. Bognor kept on coming and Heath's low cross was met by Wild running in but he could only deflect it on to the bar. Extra time began with the Rocks still on the attack – as they had been for most of the second half. Finally Bognor went back in front nine minutes into extra-time and it was Wild who restored their advantage with a nice left-foot strike from 20 yards after a neat move through the centre. EG almost levelled it up again when a free-kick into the box was headed only just wide of the post by a defender. A minute into the second period of extra-time the Rocks had their two-goal lead back after Muitt seized on a loose square pass across the EG backline and played it unselfishly to Wild, who poked in. It was three four minutes later when Muitt - named man of the match - ran at the defence and curled a superb shot into the top corner. That was Muitt's work for the night done and he was replaced by Linden Burke – another Chi College youngster. The goals kept flowing and Mitchell Chapman made it 5-3 from close in after the Bognor defence went to sleep. East Grinstead sensed the chance of a big finish and were denied sight of goal by a timely tackle. Still they pressed and the Rocks defence were having to be on their guard but eventually time ran out and the Rocks were through and able to look forward to a semi-final at Culver Road, Lancing. Rocks: Magee, McCormick, Whyte, Tuck, Field, Read, Osborne, Gilot, Wild, Muitt, Scutt. Subs - Heath, Burke, Kardos. East Grinstead: Daly, Bray, Miller-Neave, J Johnson, Gunner, R Johnson, Pearse, Chapman, Day, Cundle, Boulding. Subs: Emptage, Landais, Cooney, Finley, Pead.